WICKHAM’S CAY, Tortola, VI - “The Rotary Club of Tortola’s Unwavering Commitment to Fight Poverty, Promote Youth Development and Improve Health Services.” This is one of the objectives that propelled the Club to stage yet another ‘Grand Affair’ and among the top priorities for funding are the construction of a state of the art Youth Empowerment Centre (YEC) and the completion of the equipping of the Neo-Natal unit at Peebles Hospital. This was revealed to reporters yesterday afternoon February 19, 2015, at a press briefing of the club held at The Moorings following their weekly meeting. In attendance and speaking of the significance and the event titled ‘The Grand Affair – East meets West” were Past President Mrs Lorna G. Smith, Past President Mr Percy Rhoden, Past President Mr Gerard St. C. Farara QC, Club President Mr Henry O. Creque and Assistant District Governor Mrs Delma Maduro. “We have some specific, although not exclusive, initiatives for this year’s Grand Affair and Auction which will be held under the patronage of His Excellency The Governor, John S. Duncan OBE and Mrs. Anne Marie Duncan at Government House on Saturday, February 28, 2015. We are going to support the creation of a Youth Empowerment Centre in Purcell Estate on Tortola (akin to the very successful YEP at the eastern end of Tortola) for which we expect to apply and receive a matching Global Grant from the Rotary Foundation,” outlined Mr Farara. Speaking to the construction of the Youth Empowerment Centre President Creque supported by his colleagues noted that it is in dire need to fill certain voids in the community and those surrounding Purcell and according to Mr Rhoden they are looking at the possibility of constructing a building from the ground up and one that can be deemed state of the art. In addition to the aforementioned project the club has it eyes on surpassing their target of $150K of last year and said that every last penny will return to the community via various projects, interventions and events. Among those are the ‘Baby think it over’ programme which they are currently piloting at the St George's Secondary School, continued support for the Family Support Network among others. Tickets for the event costs $200 each. The event will be a grand gala and auction and with an appetizing dinner prepared in the Western and Eastern styles, persons to be dressed in the cultural styles of all parts of the world, entertainment by local performers and those from the Western side along with music to party and have a good night by select DeeJays. For over 47 years The Rotary Club of Tortola was said to have been changing lives positively in the Virgin Islands (VI) and abroad. Over the last 10 years, the Club has worked through its signature ‘Grand Affair and Auction’, to raise funds for specific and general needs within the community. 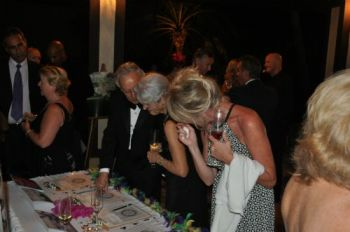 Last year’s event raised almost $130,000 for worthy causes, in large measure due to the generosity of individuals, businesses and friends of the VI. This year the bar is higher, as the need has become much greater. “In spite of the apparent aura of prosperity that exists in our community, we now, more than ever, need the support of all of us to help withrelieving poverty, and to ratchet up our efforts in the areas of youth development and improving the delivery of health services,” said the club in a statement. The club members have also alluded to recognizing the fact that there is significant poverty in the Territory, a sad reality of the times. They intend as a club to investigate and identify families and individuals in need and to provide meaningful and targeted support, either directly or through the existing voluntary organizations, all of which are underfunded, under resourced and over stretched. 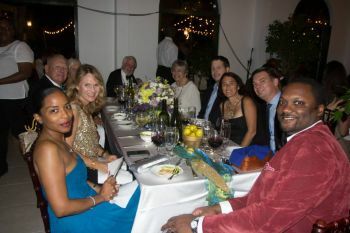 “Accordingly, we are grateful to the many individuals and businesses who have committed their support to this event and to the causes and we encourage others to partner with the Rotary Club of Tortola in its unwavering commitment to fight poverty in our community, to provide meaningful and regular assistance to our youth and to assist in improving the delivery of health care in the BVI, by giving/donating generously in cash and kind to this year’s Grand Affair event,” the club said. Contact the Rotary Club of Tortola President Henry O. Creque or one of the Co-Chairs of the Grand Affair’ Committee – Past Presidents Gerard St C. Farara, Lorna G. Smith or Mr. Percy Rhoden [for tickets],” said Mr Farara. look deeds want to bees do some of dem realy care about the ppor? I wonder if any of them will give the poor a ride in their flashy cars?? We stand looking ride for college same people in this picture drive by. They don't really care. Just want to act like they white counterparts. Can someone please tell me why our people can't be positive? Because people like you so exist. Hospital done get enough and getting enough off people. For the heads on top to enjoy. The one on the middle of pic one has no classw, look he he sprawl off eh? with hands on the de hip lol he sassy. YEP center East is least used youth center on island. Because of politics. Now you want to build another one. So it can just sit there. People here really don't care about youths. It just looks politically correct to act like you care. If you really cared why not pick a place like up here theBellevue Gym. It needs to be restored and its in an area with a lot of youths need help. Oh I got it. No one can drive by it and honor themselves everyday. Why not look areas that need help and not where you think everybody can drive by and see your sign.